REMARK: Todd did not separate C. fluv. From C.plac. var euglypta. Also in Karin's count separation was done inconsistently. Therefore both are lumped in C.plac.var.euglypta. Wallace, J. 1960. 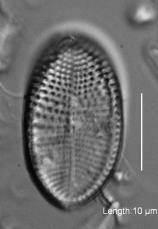 New and Variable Diatoms. Notulae Naturae (Academy of Natural Sciences of Philadelphia) (331): 8 pp. Phycology Section, Patrick Center for Environmental Research, Academy of Natural Sciences of Drexel University. Cocconeis fluviatilis (NADED 16010). 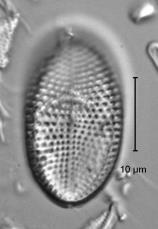 https://diatom.ansp.org/taxaservice/ShowTaxon1.ashx?naded_id=16010. Accessed 20 Apr 2019. This web service reports all information about a given algae taxon available at the time of retrieval.